Nick: 2018 has been an amazing year! I was selected as one of Canada’s Loran scholars (that’s a $100,000 scholarship) and started post-secondary at the University of Kings College in Halifax, Nova Scotia. Looking forward to the memories to be made in 2019! Morgan: I graduated high school in June 2018 with awards, and am now studying at Loyalist College and studying child and youth development. I’m supporting a local initiative run by a student in the town of Belleville who attended the summit in 2017. Abbie: This was my first year on the youth advisory committee. I am also on student council as a grade 11 representative. I also joined a youth group that is called YAC which is a youth council for teens in my area. Gavin: I am currently pursuing my undergraduate degree in psychology at Carleton University. I am loving every minute of my first year in Ottawa! 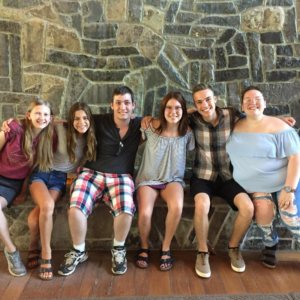 Olivia: In 2018, I joined the R4I movement and I have enjoyed sitting on the youth advisory committee. This group has changed my life forever. Cameron: In the late fall of 2018, I was appointed as a committee member to the town of St. Marys Accessibility Advisory Committee. I am looking forward to bringing my knowledge of community inclusion and youth leadership to my role. Eva: I am still currently working hard at my high school degree but have really enjoyed getting to know the other Advisory Committee members this year as well as working with fellow leaders at home to grow our local Include2Improve initiative in Perth County. I also had the opportunity to travel to the Netherlands this year to visit my family! Jesse: This year I was appointed to secretary of the Self-Advocates/Ambassadors Committee in my community of Bancroft. This is my second year on the committee and I am enjoying my leadership role this year! Ashlyn: I will be graduating in June 2019, and I am hoping to go into a university nursing program. I am also working on some humanitarian efforts in my school to promote a more positive environment!